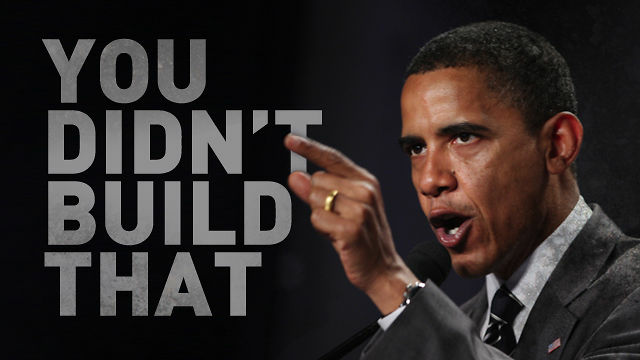 "Mr. Obama says that it’s government that laid the foundation for all these great things like roads and bridges and the Internet, but the government didn’t just do all those things on ITS own either. In fact, a government can’t do anything on its own since it relies on the blood, sweat, and tears of its subjects in order to do anything. Government, in its most basic form, is coercion. It is the authority to force people to do what they don’t want to do—a monopoly of violence. With regard to all these positive externalities that the president talks about, the government requires funding from people who pay involuntarily. The government couldn’t pay for teachers without stealing money through taxation of private enterprise first. The government couldn’t build roads without taking land."